I have been using iChat for about a month. Although it's a great program and has the ability to be used with most of the major chat interfaces I got frustrated with the lack of built in customizable features very quickly. I never took the time to download a new client or find a way to add features to iChat itself, but the other day I was reading a forum that mentioned Chax. 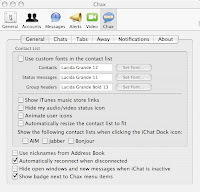 Chax is a freeware application that puts iChat on steriods without the added rage. The install is simple and clean adding a new tab in the preferences window of iChat entitled "Chax." Simply put, Chax adds features that iChat should have built in and is a must have for anyone who uses iChat as your main chat client. Chax can be downloaded here.